Shinjuku Station (新宿駅) is a train station located in Shinjuku, Tokyo, Japan. The station serves as a major hub between Tokyo and many of its nearby western suburbs and is used for commuter, metro, and inter-city rail lines. An estimated 3.5 million people pass through Shinjuku station every day, making it the busiest train station in the world. Shinjuku is second only to Nagoya Station in physical size and has more than 200 exits in multiple locations. Shinjuku station originally opened in 1885 as a stop on the Akabane Shinagawa Line, which has since been absorbed as part of the Yamanote Line. At the time, Shinjuku was a small town with minimal traffic. The Chuo Line was added in 1889, followed by the Keio Line in 1915, the Odakyu Line in 1923, and subway service in 1959. After each addition, Shinjuku grew slightly as more traffic passed through each day. Shinjuku Station has also become well known as a site of many portentious events. In 1967, a freight train with jet fuel attached erupted in flames on the Chuo Rapid line tracks and in 1968 and 1969, multiple different protests erupted here as a sign of the times in post war Japan. In 1995, a month after the Tokyo Subway attacks, another member of the Aum Shinrikyo cult attempted to set off a second gas attack in Shinjuku station, but it was thwarted. Shinjuku Station is built around the JR East facilities and consists of seven separate ground level platforms with 14 total tracks on a North/South run. There are two major overhead and underground concourses and most lines traveling through are either urban or suburban mass transit. The JR line serves about 1.5 million of the total 3.5 million passengers passing through each day. 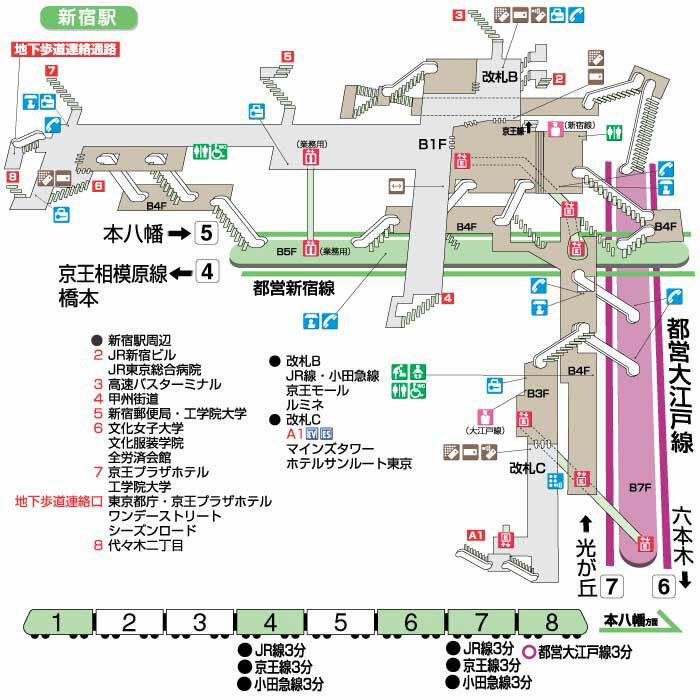 There is a single, separate line which has its own terminus in Shinjuku station parallel to the JR platforms. Handling about 490,000 passengers daily, the Odawara Line is a massive commuter route that connects through suburbs to the city of Odawara on the coast. There are 10 platforms for this line, all built beneath the Odakyu Department Store.